Rowan Pennink has long been known in Modified circles as a man of few words. His aggressive style in competition belied his reserved nature away from the action. And walking away from racing competitively was something Pennink handled with the same restrained style he’s long been known for. In a racing world where social media bravado rules, there was no loud attention grabbing announcements from the Huntingon Valley, Pa. driver on Tuesday. Pennink confirmed exclusively to RaceDayCT Tuesday that he will retire from competition immediately due to ongoing back issues. Pennink missed the season opening NASCAR Whelen Modified Tour event on March 17 at Myrtle Beach Speedway after having emergency back surgery involving a pair of herniated discs in February. Back issues resurfaced for Pennink following the Whelen Modified Tour event on Aug. 16 at Bristol (Tenn.) Motor Speedway. Pennink and his girlfriend Nicole Kirstin welcome their first child, daughter Jordan, on Aug. 8. Pennink, who turns 33 on Sept. 3, walks away from the sport having left his mark across a broad spectrum of Modified racing fronts over the last decade. Since 2006 Pennink has established himself as one of the top contenders weekly on the NASCAR Whelen Modified Tour, won a Valenti Modified Racing Series championship and a pair of SK Modified titles at Stafford Motor Speedway. “I think mostly I’m going to miss my second family which is the racing community,” Pennink said. “I’ve been racing for about 20 years and I’ve made a lot of friends and met a lot of great people throughout the years. Obviously I’m going to still keep in contact with them and hopefully make it to some races to hang out and have some fun at the race track. Pennink arrived on the local Modified racing in 2006 in the SK Modified ranks at Stafford Speedway. His family owned team ventured the next year full-time to the NASCAR Whelen Modified Tour. He made 166 Whelen Modified Tour starts since 2007 with three career victories, 38 top-five’s and 86 top-10’s. His last victory with the series came on April 9, 2017 at Thompson Speedway. After spending nine years driving for a family owned team, he has spent the last three seasons driving the iconic Ole Blue No. 3 for Boehler Racing Enterprises. Despite only running nine of 11 events this year, Pennink currently sits seventh in the Whelen Modified Tour standings. “The Boehler Family gave me a great opportunity to drive a historic car and gave me one of the best cars I’ve ever driven in my career……. STAFFORD – Rowan Pennink saved the dramatics for the closing stages of the night Friday at Stafford Motor Speedway. Pennink passed Woody Pitkat for the lead on lap 78 and went on to win the 80-lap Valenti Modified Racing Series feature Friday at Stafford Motor Speedway. It was the third victory in four Valenti Modified racing season events this season for Pennink. “Those guys on [my] team are brining amazing cars to the track every week,” said Pennink, the 2013 series champion. It was the 14th career Valenti Modified Racing Series victory for Pennink, of Huntingdon Valley, Pa., and his third series victory at Stafford. Pitkat, of Stafford, was second and Donnie Lashua of Canaan, N.H. third. WATERFORD – Car owner Gary Casella said, “trying different things”, driver Rowan Pennink stated, “a little bit of a different setup than they normally come here with.” Whatever the plan was, it worked, as Pennink, of New Egypt, New Jersey, grabbed the win in Saturday’s Valenti Modified Racing Series 100-lap race at New London-Waterford Speedbowl, Waterford, CT.
Pennink’s victory was his second of the young VMRS season, and his second series win at the famed Speedbowl, now in it’s 68th season. His only victory there was in 2009. Pennink started outside front row in a field of 27-cars but did not lead the event until lap-74 when he went by Woody Pitkat, of Stafford Springs, CT. to nail down the win. Local driver Anthony Flannery, in only his ninth race in a modified race car, was mixing it up with much more experienced drivers. The East Hampton, CT driver moved into second on the 78th circuit. From that point Flannery chased after Pennink with a difference of 0.238 between the two at the checkered flag. “He was fast putting pressure on me,” Pennink said of Flannery. “ I was tight in the middle. He was getting a good run. I had very good bite up off and kept him behind me. He had a very good race – ran strong and congrats to him,” Pennink concluded. Current point leader Anthony Nocella finished third followed by Pitkat, who overcame an early race mishap to eventually lead the race finishing fourth and Mike Willis Jr, who started 21st on the field, finishing an impressive fifth. Early race leader Eric Goodale (laps 1-48) finished sixth, rookie Cameron Sontag seventh, Sammy Rameau eighth, Mike Holdridge ninth, and Tony Ricci tenth. The race was slowed eleven times because of minor crashes, a called back re-start, and a couple of stalled cars. 18-drivers finished on the lead lap. Qualifying heat winners were Nocella, Pennink, and Dave Etheridge. All 27-drivers that entered the event started the feature race. STAFFORD, Conn. — There has been nobody better than Ryan Preece lately when it comes to NASCAR Whelen Modified Tour racing at Stafford Motor Speedway. For the second straight year, Preece drove the No. 6 TS Haulers Chevrolet to Victory Lane at the track’s NAPA Auto Parts Spring Sizzler 200. It continues a hot streak for the Berlin, Connecticut, driver at the historic half-mile. He’s the first driver to win the Sizzler in back-to-back years since Bobby Santos III in 2013-14. Jon McKennedy was sixth, followed by Matt Swanson, Justin Bonsignore, Timmy Solomito and Rob Summers. Bonsignore holds a one-point lead over Dowling, and a five-point advantage over Lutz. The NASCAR Whelen Modified Tour returns to the track in Massachusetts at Seekonk Speedway on Saturday, June 2. THOMPSON, Conn. — Even though he finished third in the championship standings last year, Justin Bonsignore struggled for much of the NASCAR Whelen Modified Tour season. Craig Lutz put together an impressive final stint of the race to charge through the field and finish second, while Pennink, in his first race back since offseason back surgery, finished third. Ryan Preece and Matt Swanson completed the top five. THOMPSON – Anyone questioning whether or not Rowan Pennink was ready to return to competition after offseason back surgery got their answer quite definitively Saturday at Thompson Speedway. In his first event back since surgery in January, Pennink rolled to victory in the 50-lap Valenti Modified Racing feature Saturday at the Icebreaker at Thompson Speedway. Chase Dowling of Roxbury was second and Anthony Nocella of Woburn, Mass. third. Pennink had surgery on January 31, which forced him to miss the first NASCAR Whelen Modified Tour event on March 17 at Myrtle Beach (S.C.) Speedway. Pennink went by Richard Savary for the lead on lap 19 and never trailed again. He held on through two late restarts with under six laps remaining. NASCAR Whelen Modified Tour driver Rowan Pennink won’t be in the lineup when the series kicks off the 2018 season March 17 at Myrtle Beach Speedway. Pennink revealed exclusively to RaceDayCT on Wednesday that he recently had emergency surgery involving a pair of herniated discs in his back that will force him to miss the Performance Plus 150 at Myrtle Beach Speedway. Pennink said he doesn’t expect the Boehler Racing Enterprises team to be at the Myrtle Beach event with another driver. Depending on his recovery, Pennink said he may also miss the second event of the Whelen Modified Tour season on April 8, the Icebreaker 150 at Thompson Speedway. When the dust settled on the season finale for the Exit Realty Modified Touring Season Sunday at the New London-Waterford Speedbowl, it was Rowan Pennink and Eric Goodale ready for some large payments from track officials. Pennink, of Huntingdon Valley, Pa. won the event 125-lap MTS feature, which carried a first place prize of $5,000. Eric Goodale of Riverhead, N.Y. finished second to capture the first Modified Touring Series championship, which came with an advertised award of $10,000. Chris Pasteryak of Lisbon was third. Goodale was one of five drivers that came into the last event vying for the championship. He was joined in the championship chase field by Tommy Barrett, Jon McKennedy, Woody Pitkat and Richard Savary. The five drivers had to start at the rear of the 22-car field Sunday. Barrett, of Millis, Mass., fourth. McKennedy, of Chelmsford, Mass., was fifth. Savary, of Canton, Mass., was 13th. Pitkat, of Stafford, was involved in a wreck and finished 21st. Barrett inherited the lead from Pasteryak on lap 54 when Pasteryak pitted out of the lead. Pennink was able to get by Barrett for the lead near lap 87 and took Goodale with him to second and Pasteryak to third. THOMPSON, Conn. -- Back in April, Doug Coby walked away from a wrecked race car without even completing one lap in the Icebreaker 150 at Thompson Speedway Motorsports Park. Six months later, Coby capped the season at Thompson by completing an unthinkable comeback to win his fifth NASCAR Whelen Modified Tour championship. Sunday's fifth-place finish in the Sunoco World Series 150 was enough to completely erase his disastrous start to the season and wrap up his fourth straight title. The Milford, Conn. driver becomes the first driver since the NASCAR Whelen Modified Tour began in 1984 to accomplish the feat and only the third in the history of NASCAR modifieds, joining NASCAR Hall of Famers Richie Evans and Jerry Cook. "We just kind of tugged away this year," Coby said. "We won one race in 2014 when we won the championship and we only won once this year. We were just so consistent." Timmy Solomito, who entered the race third in the championship standings and one of six drivers still in contention for the crown, used a pass with just two laps remaining to capture the victory the race that was pushed to 155 laps because of a late caution. The victory was the fifth of the season for the Islip, New York, driver but it wasn't enough to get him the title. Coby finished with 604 points, six ahead of Solomito. Justin Bonsignore finished third, 10 points back of Solomito, while Rowan Pennink and Eric Goodale rounded out the top five in the championship standings. Coby was determined to control his own destiny. The points leader entering the finale, he started on the front row with polesitter Chase Dowling and immediately jumped to the front to lead the first 82 laps to clinch the bonus points for most laps led. After his first pit stop, he restarted outside the top 10 and wasn't able to get all the way back to the front. But it didn't matter. A late charge was enough to hand him the championship behind the wheel of his No. 2 Mayhew Tools Chevrolet. "We were good all year and we were kind of under the radar. This was a different championship because we to crawl all summer because we had to get back in it," Coby said. "We had to chip away this year. The common denominator in all of these titles was a team that never quit." Dowling finished second -- crossing the finish line .043 seconds behind Solomito -- while Ron Silk was third and Pennink fourth. Andrew Krause finished sixth, followed by Woody Pitkat, Dave Sapienza, Jamie Tomaino and Bonsignore. Ryan Preece finished 26th in the race and fell to sixth in points. However, he was able to wrap up the NASCAR Whelen Modified Tour owner's championship for Ed Partridge. Preece missed two races -- one for his wedding and one to run the NASCAR XFINITY Series race at Kentucky Speedway -- and combined with George Brunnhoelzl III and Jon McKennedy to win the title for Partridge's No. 6 TS Hauler Chevrolet team. Coby and Partridge will be honored as champion of the unified Whelen Modified Tour as part of the champions celebration in Charlotte, North Carolina in December. To say that Rowan Pennink had an eventful Friday night at Stafford Motor Speedway would be an understatement. The Modified racer from Huntingdon Valley, PA completed a sweep of the Modified Racing Series and SK Modified features at the Connecticut oval, but the successful night didn’t come without a little bit of drama and some fisticuffs in victory lane. In the 40-lap SK Modified race, Pennink fought to the front while looking for his first SK win of 2017. After taking the lead on Lap 25, Pennink had some company with two laps to go from the all-time winningest driver in Stafford history, Ted Christopher. Christopher gave Pennink a shot to the back bumper into turn three, allowing “TC” to get inside off turn four for the lead coming to the white flag. Pennink fell in behind before returning the favor with a bit more force in turn three on the final lap. Christopher washed up the race track and kept the wheels straight, but not before Pennink beat him to the checkered flag. After the two drivers went through some stop-and-go activity on the cool down lap, they reached victory lane. Pennink climbed from the car, receiving the famous Stafford 50-percent of cheers and 50-percent of boos a driver normally gets when they tangle with Christopher. But before Pennink could be interviewed, Christopher came over and confronted Pennink, with shouts turning into shoving. The shoving then became swings and soon it was a full-blown melee with both teams and supporters going at it. The order would be restored after several tense seconds, with Pennink offering his fresh take over the track’s public address system. “Ted gave me a shot, got me loose. He got under me. I just gave it right back to him, that’s what it takes here when you’re racing against him. You got to step up to his level of dirtiness so that’s what I did,” Pennink said in victory lane. Christopher declined the usual podium interview and while not giving a full take on what happened after the race was still very upset with Pennink. His comments to Speed51.com were brief and filled with expletives about what occurred on the race track. Christopher had also been dealt another bad break with an engine failure following heat racing with his MRS car, sidelining him from the event. Pennink meanwhile stayed in the top five all through the start of the 80-lap MRS feature, making his move for the lead on Lap 57 and staying there to get his first MRS win of 2017. The win was also his second in three races for car owner Gary Casella. At the end of the night, Pennink offered a further perspective on what had occurred earlier during and following the SK feature. The events did not diminish the overall feeling of accomplishment from the night, especially in the SK Modifieds, where the No. 99 Hitchcock family-owned team had been struggling to get to victory lane after winning the championship the last two years. As for Pennink and Christopher, their cooldown period will not last long, as the two are entered for the NASCAR Whelen Modified Tour race at Oswego Speedway (NY) Saturday night. Pennink is strictly focused on getting the BRE No. 3 its second win of 2017. Rowan Pennink has had plenty of notable accomplishments behind the wheel of a Modified over the past decade. Saturday the Huntingdon Valley, Pa. driver got another first. Pennink won the 125-lap Exit Realty Modified Tour Series event Saturday at Monadnock Speedway in Winchester, N.H. It was the first series victory for Pennink, a regular on the Whelen Modified Tour and a former Valenti Modified Racing Series champion and the current two-time defending SK Modified division champion at Stafford Motor Speedway. Woody Pitkat of Stafford was second and Eric Goodale of Riverhead, N.Y. third in the 15-car field at Monadnock. Pennink went by Goodale for the lead on lap 109 with Pitkat following to second place a lap later. BRISTOL, Tenn. -- Patrick Emerling swept his way to Victory Lane with a near-perfect performance at Bristol Motor Speedway on Wednesday. The Orchard Park, New York, driver was fastest in practice, won the Coors Light Pole Award and proceeded to lead 148 of the 150 laps en route to his first career NASCAR Whelen Modified Tour victory. "It's just a dream come true," said Emerling following the win at the historic track dubbed 'Thunder Valley.' "It's incredible. We only run a handful of the Whelen Tour races and to come down here and win practice, catch the pole and lead every single lap, it's an incredible feeling for us as a team." The win for the 24-year-old came in his 78th career start and just his third of 2017. He held off challenges from Chase Dowling and Justin Bonsignore on restarts in the first half of the race, then held off four-time tour champion Doug Coby in the dash to the finish. He crossed the line 1.239 seconds ahead of Coby. Prior to Wednesday, Emerling's best career finish was a second at New Hampshire in 2015. For Coby, the second-place finish was the third straight in Whelen Modified Tour competition and it helped him claw back towards the top of the championships standings. Timmy Solomito, who was caught up in a Lap 68 accident, came home 15th to maintain a two-point edge on Rowan Pennink. Ryan Preece finished fifth and is nine points behind Solomito, while Coby is 17 points back. Justin Bonsignore finished third and is 19 points out of first. Chase Dowling and Preece rounded out the top five at Bristol. Andy Seuss was sixth, followed by Pennink, Ronnie Williams, Bobby Santos and Matt Swanson. The Bush's Beans 150 will air on NBCSN Saturday August 26 at 3 p.m. ET. The NASCAR Whelen Modified Modified Tour returns to the track at Seekonk Speedway on Saturday August 26, with the running of the Seekonk 150. In the 100-lap NAPA SK 5k feature event, Michael Gervais, Jr. took the lead at the green with Cam McDermott, Glen Reen, Dylan Izzo, and Keith Rocco making up the top-5. Mike Christopher, Jr, was sixth followed by Todd Owen, Dan Avery, Tom Abele, Jr., and Rowan Pennink. Rocco went around Reen to move into third on lap-11 as Gervais was comfortably a half second ahead of McDermott in the battle for the race lead. Josh Wood dropped off the pace and he brought his car behind the wall on lap-17 and looked to be finished for the night. Chase Dowling cracked into the top-10 as he was slowly working his way towards the front. With 25 laps complete, Gervais was still in command with McDermott, Rocco, Reen, Pennink, Owen, Dowling, Izzo, Mike Christopher, Jr., and Ryan Preece making up the top-5. Dylan Izzo spun coming out of turn 2 to bring the caution out with 26 laps complete. Gervais took the lead on the restart with Rocco pulling alongside. The lead duo fought side by side for the lead with Rocco taking the lead on lap-29 with a pass in turn 2. Pennink also got around Gervais to move into second while McDermott was now side by side with Gervais for third on lap-31. A multicar incident in turn 1 involved Tom Bolles, Ronnie Williams, Izzo, Avery, Ted Christopher, Brendon Bock, Abele, and Tommy Membrino, Jr. brought the caution out with 31 laps complete. Rocco took the lead back under green with Pennink moving into second. McDermott was third with Dowling fourth and Gervais fifth. Pennink took to the outside groove and took the lead from Rocco on lap-34. Carlos Gray spun in turn 4 to bring the caution out with 36 laps complete. Pennink and Rocco ran side by side for the elad with Rocco leading the lap by a nose at the line. One lap later saw Pennink power his way back into the lead with Dowling moving to the inside of Rocco and taking second. Preece was up to fourth behind Rocco with McDermott still running in fifth. Dowling took a look to the inside of Pennink in turn 3 on lap-41 but Pennink was able to hold him off. After applying heavy pressure, Dowling was finally able to make a pas stick for the lad and he took the lead from Pennink on lap-47. Preece was third with Rocco in fourth and Owen in fifth. McDermott was sixth, Mike Christopher, Jr. was seventh and charging his way back towards the front, Glen Reen was eighth, Williams was ninth, and Avery rounded out the top-10 at the halfway point. Tommy Membrino, Jr. spun on the backstretch to bring the caution out with 53 laps complete. Under the caution, McDermott and Ted Christopher came to pit road for adjustment. Dowling took the lead back under green with Preece taking second from Pennink. Owen and Rocco were side by side for fourth with Christopher, Jr., Williams, Gervais, Avery, and Matt Galko making up the top-10. Carlos Gray spun in the middle of turns 1+2 to bring the caution out with 67 laps complete. Dowling took the lead on the restart after fending off a challenge from Preece with Owen making a strong move to get up to third behind the lead duo. Pennink was fourth with Rocco in fifth. Williams was in sixth with Mike Christopher, Jr., Ted Christopher, Brendon Bock, and Avery making up the top-10. Dowling began to stretch out his lead over Preece, pulling out to nearly a one second lead with 22 laps to go. Owen and Pennink were locked in a duel for third behind the two lead cars with Rocco, Williams, Mike Christopher, Jr., and Ted Christopher lined up single file behind them. Pennink was able to finally work his way past Owen to move into third on lap-85 after he had tried to make the move for the past several laps. Dowling pulled away from Preece in the closing laps to score his biggest paying victory of his Stafford career. Pennink finished third with Owen and Rocco rounding out the top-5. Next up on the schedule is the Whelen Modified Tour All-Star Shootout on July 14 followed by the Nor’easter 100 the next day, both at New Hampshire Motor Speedway. In the 40-lap SK Modified® feature event, Dan Avery took the lead at the green and he led the first lap before a melee broke out in turn 2 when Tony Membrino, Jr. spun in turn 2 in front of the entire field. Nearly two-thirds of the field were involved in a pileup and brought the caution out. Avery took the lead back under green with Matt Galko hounding him for the race lead while he was side by side with Cam McDermott for second. Mike Christopher, Jr. was fourth and Glen Reen was fifth. Galko finally got by McDermott and he took the lead from Avery on lap-5. McDermott followed Galko by Avery and Christopher, Jr. took third from Avery on lap-8. Reen was now side by side with Chase Dowling for fifth with Dowling taking the spot on the outside on lap-9. On lap-12 Ryan Preece went around Dowling in the outside groove to move into fifth place as Galko continued to hold the lead with McDermott, Christopher, Jr., and Avery lined up behind him. The caution came out with 13 laps complete as Josh Wood’s car was smoking heavily and came to a stop at the exit of pit road. Galko took the lead again with McDermott, Avery, Dowling, and Christopher, Jr. lined up behind him. The caution came back out with 14 laps complete for Tommy Membrino, Jr., whose car came to a stop at the entrance to pit road. Galko took the lead on the restart with McDermott holding onto second. Dowling was third with Avery and Preece side by side for fourth. Preece took the spot from Avery on lap-18 after the two cars crossed over and Preece was now on the inside of Avery. Ronnie Williams tried to follow Preece by Avery but he settled back into line in sixth. Dowling was continuing to charge his way towards the front as he took second from McDermott and his move opened the door for Preece to follow him through as McDermott fell back to fourth. With 10 laps to go, Dowling had caught up to Galko and he began working him over for a way to take the lead. That pass materialized on lap-33 as Dowling went to the lead in turns 1+2. Preece was third with McDermott and Williams making up the top-5. The caution came out with 35 laps complete for McDermott, who spun in turn 4. The race restarted with Galko making a power move to the inside of Dowling in turn 3 to pull alongside in a duel for the lead. The two cars ran side by side lap after lap with neither driver giving an inch. The caution came out with 38 laps complete for Christopher, Jr., who got sideways in turn 4 and kicked up debris on the track. Galko took the lead on the restart but Dowling was still on his outside and they took the white flag side by side. Preece was right on the leaders’ bumpers if one of them slipped up but Galko was able to get a slightly better run coming out of the last corner and he beat Dowling to the checkered flag by a half car length to pick up his first career SK Modified® feature victory in his fifth season in the division. Preece finished third with Williams and Rowan Pennink rounding out the top-5. In the 40-lap SK Modified® feature event, Dan Avery took the early lead with Todd Owen, D.J. Burnham, Glen Reen, and Rowan Pennink behind him. The caution came out with 3 laps complete as Owen and Burnham spun into the turn 1 wall. Reen took the lead on the outside of Avery and Cam McDermott was right with Reen and he was now side by side with Avery for second with Pennink in fourth and Tony Membrino, Jr. was up to fifth. McDermott took second on lap-6but Avery came right back and retook the spot on lap-7 as Pennink was looking to get by both cars in fourth. Avery settled into second with Pennink taking third from McDermott on lap-8 as Reen continued to lead the race. Avery made a move to the inside of Reen to move to the front on lap-9 and he brought Pennink with him to drop Reen back to third. Chase Dowling moved to the outside of Reen on lap-10 and he took over third and then he moved side by side with Pennink for second with Avery still out front. Keioth Rocco was making his way through traffic towards the front as he was up to fifth when the caution came out with 12 laps complete for a spin by Eric Berndt in turn 2. Avery and Dowling were side by side for the lead back under green with Dowling getting clear on lap-14. Avery now had Pennink to his outside in a fight for second with Rocco in fourth and Reen was fifth. Dylan Izzo and Berndt spun on the frontstretch to bring the caution back out with 16 laps complete. Dowling took the lead back under green with Pennink moving up to second. Avery moved into third with Rocco in fourth and Reen in fifth. Pennink made a move to the inside of Dowling in turn 4 on lap-19 to take over the lead but that move was negated by the caution flag for spins in turns 1+2 by Membrino and Berndt. Pennink was able to keep pace with Dowling in the outside groove on the restart before slotting back into second just in front of Rocco. Avery was fourth with Reen and McDermott side by side for fifth. The caution came back out with 21 laps complete for a spin coming out of turn 4 by Berndt, Tyler Hines, and Robert Goulet. The caution came right back out on the restart as there was a multicar incident at the entrance of turn 3 involving the cars of Jeff Baral, Tom Bolles, Izzo, Tom Abele, Jr., Hines, and Goulet. Dowling took the lead on the restart with Rocco alongside Pennink for second with Reen and Avery side by side for fourth. Rocco got clear to second on lap-23 with Pennink, Reen, and now Ted Christopher lined up single file behind Dowling, who was still out front. Christopher got by Reen to move into third on lap-29 as Dowling, Rocco, and Pennink were starting to stretch their advantage over the field out. That advantage was erased by a spin in turn 4 by Mike Christopher, Jr. that brought the caution out. Dowling took the lead back under green with Rocco slotting into second and Pennink into third. Ted Christopher was fourth and Reen was fifth when the caution came back out for spins in turn 4 by Mike Christopher, Jr. and Goulet. Dowling and Rocco were side by side for the lead again with Christopher moving into third. As the field hit turn 3, Pennink and Christopher touched with Christopher’s car getting shot up the track into the path of Matt Galko, who hit the wall to bring the caution back out. Dowling took the lead with Christopher getting by Rocco to move into second. Pennink and Ronnie Williams were side by side for fourth with Reen right behind them in sixth. With 5 laps to go, Dowling, Christopher, Rocco, Pennink and Williams were lined up single file. Christopher was working over Dowling while Pennink was looking high and low for a way to get around Rocco. Dowling led Christopher to the checkered flag to pick up his second win in three races in 2017. Rocco finished third with Pennink and Williams rounding out the top-5. HAMPTON, Va. – Timmy Solomito muscled his way past Doug Coby with seven laps to go to score the victory in Saturday night’s City of Hampton 150 at Larry King Law’s Langley Speedway – his second victory of the season in the NASCAR Whelen Modified Tour. The win at Langley marks Solomito’s second of the season. Earlier this year, he won the Whelen Modified season opener at Myrtle Beach (S.C.) Speedway and backed it up with a second-place finish at Connecticut's Thompson Speedway Motorsports Park. Despite an 11th place finish at Stafford, the strong start to the season has Solomito thinking big picture. The next race for the NASCAR Whelen Modified Tour will be held at Connecticut's Thompson Speedway Motorsports Park on June 14th. THOMPSON – On the NASCAR Whelen Modified Tour the Boehler Racing Enterprises car is a rolling piece of visual history of Modified racing. Iconic is the term most often used to describe the car, long dubbed Ole Blue. The late Lenny Boehler, a legendary mastermind of Modified racing built his No. 3 Ole Blue team to fabled status and his son Michael Boehler has long kept the team rolling. Sunday Rowan Pennink drove the historic ride back to the front in Whelen Modified Tour action. Pennink used a lap 148 pass of Bobby Santos III to take over the lead and go on to victory in the Whelen Modified Tour Icebreaker 150 at Thompson Speedway. It was the first Whelen Modified Tour victory in a points event for the team since Ryan Preece won with the car on Aug. 7, 2009 at Stafford Motor Speedway. Ted Christopher won in an exhibition Whelen Modified Tour event with the car at Thompson Speedway on Sept. 9, 2012. Pennink, of Huntingdon Valley, Pa., was named the driver for the team before the start of the 2016 season. His best finish last year was a second at Monadnock Speedway in Winchester, N.H. on July 24. The 2017 season marks the 60th year for the team in competition. “Obviously one of the most historical teams that still runs the Tour,” Pennink said. “The group of guys that are on this [No. 3] team, even before I drove for them, I was always good friends with them because they were always a great group of guys. I got the opportunity to work with them and I’ve seen the [No. 3] car go around with a bunch of other drivers before and I knew that thing had the potential to win. We should have had some wins last year. It was the third career Whelen Modified Tour victory for Pennink and his first the series season finale at Thompson in 2013. He finished seventh in the season opening series event this year at Myrtle Beach (S.C.) Speedway on March 18. Timmy Solomito of Islip, N.Y. was second and Max Zachem of Preston third. Pennink started fourth and led 109 laps. Pennink relinquished the lead on lap 126 to head to the pits under caution. He was sitting seventh when the race restarted on lap 133 and he quickly followed Santos toward the front, moving to fourth with a lap of the restart. On lap 134 Santos went by Eric Goodale for second with Pennink following to third. A lap later Santos went by Ron Silk for the lead in turn four. Half a lap later Pennink made a three-wide move under both Silk and Santos to go to the lead, but the move was negated by a caution flag flying. The race restarted on lap 145 with Pennink making a quick move to get by Santo for the lead in turn two, but again his move to the lead was negated by a caution flag. On the final restart on lap 148 Santos controlled the pace through turns one and two, but Pennink tucked behind off turn two and then used a low move down the backstretch and into turn three. Pennink, Santos and Solomito fought through turn four with contact among them. Pennink came off turn four nearly getting sideways before wrangling his car back in coming onto the frontstretch. Solomito was happy to walk away with a runner-up finish after winning the season opener at Myrtle Beach. Solomito holds a four point lead over Pennink at the top of the series standings. (Stafford Springs, CT)—When the green flag falls on the 2017 SK Modified® season at Stafford Motor Speedway, Huntingdon Valley, PA native, Rowan Pennink, will be looking to make history behind the wheel of the Bob Hitchcock and Kelly Iverson owned #99 Independent Wheel machine. Pennink is the two-time defending SK Modified® track champion at Stafford, no modified driver has ever won three consecutive track titles. Before Pennink, there have been 7 back to back champions: Bill Wimble (’64-’65), Geoff Bodine (’77-’78), Richie Evans (’80-’81), Jerry Pearl (’84-’85), Mike Christopher (’89-’90), Bob Potter (’91-92, ’94-95) and Ted Christopher (’00-’01). Only three drivers in the history of Stafford have ever won three consecutive track titles; Late Model drivers Phil Rondeau (’87-’89) and Ryan Posocco (’03-’05) and DARE Stock driver Norm Sears (’06-’08). Pennink began driving for the #99 team back in 2013 and the combination looked to be destined for great things as they won in only their third race together. In racing, sometimes as quickly as you get to the top you can be relegated right back down and that’s what happened to Pennink and the #99 team as they went 22 races between the 2013 and 2014 seasons before finding themselves back in NAPA Victory Lane for a second time by taking the checkered flag in the inaugural NAPA SK 5k race. Things have really taken off since that second win, with the Pennink/99 team combination recording an astounding 18 wins in 49 starts, which works out to a winning percentage of 37%, and back to back championships. Another area where Pennink will hope to continue his good vibes is on the NASCAR Whelen Modified Tour with the Boehler Family owned #3 machine. At the first race of the 2017 season, Pennink qualified third and finished 7th after leading 38 laps at Myrtle Beach and he is looking for his first Stafford victory in the upcoming NAPA Spring Sizzler on April 29-30. Pennink has 5 top-5 and 7 top-10 finishes in 9 career Sizzler starts with a career best finish of second in the 2011 Sizzler. Pennink will begin his quest for a 3rd championship in the “Greatest Race in the History of Spring,” the 46th Annual NAPA Auto Parts Spring Sizzler on April 29-30. Tickets are available and on sale now at the Speedway Box Office. Tickets are priced at $40.00 for adult general admission tickets, $5.00 for children ages 6-14, and children ages 5 and under are admitted free of charge when accompanied by an adult. Reserved seating is priced at $42.00 for all ages. As always, Stafford Motor Speedway offers free parking with overnight parking available. Tickets are good for both Saturday and Sunday admission. All ticket prices include 10% CT Admission Tax. Discount Tickets will be available at all 71 participating NAPA Auto Parts stores beginning on Monday April 3rd. For a full list of the 71 locations throughout Connecticut, Massachusetts, New York, Rhode Island, and Vermont, please call the speedway office or visit us on the web at www.staffordmotorspeedway.com/participating-napa-auto-parts-stores. For more information or to order tickets for the 46th Annual NAPA Auto Parts Spring Sizzler, contact the Stafford Motor Speedway track office at 860-684-2783 or visit us on the web at www.staffordspeedway.com. 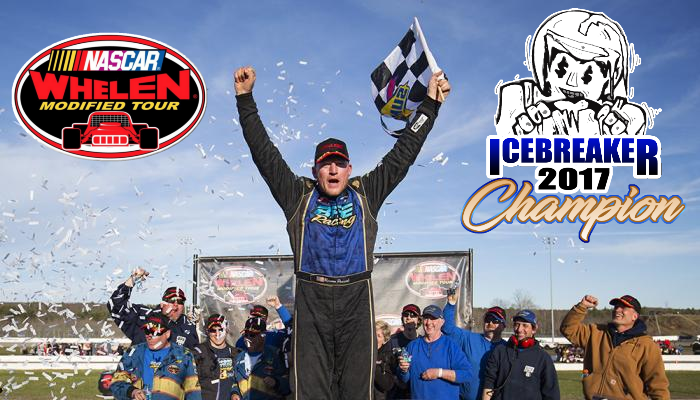 MYRTLE BEACH, S.C. – One year ago, Timmy Solomito captured his first career NASCAR Whelen Modified Tour victory in the season-opening Icebreaker at Connecticut's Thompson Speedway Motorsports Park. Fast-forward a year later, the Islip, New York, driver was celebrating a victory in the season-opening race once again. This time, the win came in South Carolina. Solomito's No. 16 Starrett Tools Ford took the lead for the final time following a late-race caution that setup the final restart and held off Rob Summers on a green-white-checkered finish to take down the victory. The win was Solomito’s fifth career on the tour after his breakout 2016. STAFFORD, Conn. (Oct. 9, 2016) – Doug Coby is the modern day dominator of Stafford Motor Speedway. Nothing that happened Sunday changed that fact. Despite a delay of a week, and nearly seven more hours during a rain-drenched Sunday, Coby still reigns supreme with a victory in the NAPA Fall Final 150. Coby rolled to his 10th career victory at the historic half-mile – now trailing only Ted Christopher’s 12 – and extended his lead in the NASCAR Whelen Modified Tour championship standings to 20 points with one race to go. It was Coby’s fourth win in the last five tour races at Stafford behind the wheel of the No. 2 Dunleavy's Repair/A&J Romano Construction Chevrolet. It also marked his fifth overall in 2016, and 22nd of his career. Justin Bonsignore entered the race trailing Coby by 13 tallies. The pair started the rain-delayed race 1-2 and traded the lead early, but Bonsignore experienced a mechanical issue and lost a lap on pit road. He was able to earn the subsequent free pass, and made it back to fourth to salvage a good finish considering the circumstances, but lost seven points on Coby in the process. Following Coby across the finish line was Timmy Solomito and Jimmy Blewett. Bonsingore, Chase Dowling, Rowan Pennink, Max Zachem, Matt Swanson, Woody Pitkat and Shawn Solomito brought home the top 10. The NAPA Fall Final 150 will be telecast on NBCSN on Oct. 16 at 9:30 p.m. The Whelen Modified Tour will conclude its season and crown a champion in the Sunoco World Series 150 on Oct. 16 at Connecticut’s Thompson Speedway Motorsports Park. STAFFORD – Last year Rowan Pennink went to the NAPA Fall Final at Stafford Motor Speedway in full drama mode in the chase for his first SK Modified title at the historic half-mile oval. This year, when the end of the season is celebrated on October 2 at Stafford with the final SK Modified feature of the season, it will be Pennink riding on cruise without worry. Friday Pennink made sure there would be no championship drama this season. Pennink, of Huntingdon Valley, Pa., finished eighth in Friday’s 40-lap NASCAR Whelen All-American Series SK Modified feature to clinch his second consecutive division championship at the track. Pennink becomes only the fifth driver in Stafford Speedway history to win consecutive SK Modified championships, joining Jerry Pearl (1984-85), Mike Christopher (1989-90), Bob Potter (1991-92 & 1994-95) and Ted Christopher (2000-01). Pennink came into the night with a 68-point lead over second place Keith Rocco in the division standings. Rocco finished fifth in Friday’s feature meaning Pennink finished the night with a 62 point lead going to the final event of the season. The most points a driver can earn for an event is 50. Last year Pennink struggled late in the season and saw a big lead the standings evaporate over the final month. He went to the final event of the season holding a 12-point lead over Ryan Preece. Preece finished third in the final event and Pennink fourth to give Pennink a final cushion of 10 points for his first title. Friday wasn’t without drama for Pennink on the way to eighth place. He nearly got caught up in a multi-car wreck early in the event on the frontstretch. In the 40-lap SK Modified® feature event, Michael Gervais, Jr. took the lead at the green with Stephen Kopcik in second. Woody Pitkat and Cam McDermott were side by side for third with Todd Owen and Matt Galko side by side for fifth place. Pitkat was on the charge as he took second from Kopcik on lap-7 and then a multi car crash occurred in turn 2 involving Nick Salva, Jeff Baral, Ted Christopher, and Mike Christopher, Jr. to bring the caution out. Gervais took the lead back under green with Kopcik, Pitkat, McDErmott, and Owen behind him. Eric Berndt dropped off the pace on lap-11 and he immediately came to pit road. Rowan Pennink took fifth from Owen on lap-14 while Keith Rocco was starting to charge as he took seventh place from Ronnie Williams on lap-15 and he was looking to take sixth from Owen on lap-17. Pennink was also continuing to march to the front as he moved into fourth and was all over Pitkat’s back bumper for third. Pennink took third from Pitkat on lap-20 and he moved by Kopcik to take second place on lap-22. Tommy Membrino, Jr. spun on the backstretch to bring the caution out with 24 laps complete. It took Pennink only one lap after the restart to overtake Gervais for the race lead. Kopcik was also able to get around Gervais to move into second before Nick Salva’s car appeared to lose an engine as a flash flame poured from the engine compartment on the backstretch to bring the caution out with 29 laps complete. Pennink took the lead on the restart with Gervais and Kopcik side by side for second. Pitkat and Rocco were side by side for fourth with Williams and Owen side by side for sixth. Kopcik took second with Pitkat and Kopcik now side by side for third when Tom Bolles spun in turn 4 to bring the caution back out with 32 laps compelte. Pennink took the lead with Gervais in second. Gervais got sideways in turn 4, which allowed Pitkat to move into second with Owen in fourth and Rocco fifth behind Gervias. Gervias’ bobble also allowed Pennink to pull away from second as Gervais was now side by side with Pitkat with 4 laps to go. Gervais took second with Rocco moving into third as Pitkat fell back to fourth. Pennink took down his sixth win of the season with Gervais, Rocco, Pitkat, and Owen rounding out the top-5. In the 40-lap SK Modified® feature event, Matt Galko took the lead on the outside of Tom Bolles at the start to set the early pace. Stephen Kopcik and Tyler Hines were side by side for third with Ronnie Williams in fifth. Just behind Williams was Mike Christopher, Jr. and Rowan Pennink. By lap-10 the order had settled into single file at the front with Galko leading the cars of Kopcik, Bolles, Williams, Pennink, and Christopher, Jr. Nick Salva’s car dropped off the pace and he limped back to pit road on lap-12. Pennink got around Williams to move into fourth on lap-13 and he nearly took third from Bolles on lap-15. After several laps of applying heavy pressure and nearly making a pass, Pennink was able to finally get by Bolles for third and he took second from Kopcik on lap-24. Williams, Christopher, Jr., Ted Christopher, Keith Rocco, Woody Pitkat, Todd Owen, Hines, and Danny Cates all got by Bolles on lap-25 as Bolles drifted high in turn 3 and slid back to twelfth place. At the front of the field Pennink was starting to apply heavy pressure to Galko and he made a move on the backstretch on lap-31 to take the lead. The caution came out with 33 laps complete for spins in turn 1 by Brian Sullivan and Jeff Gallup. Pennink took the lead back under green with Kopcik and Galko side by side for second. Ted Christopher was fourth with Mike Christopher, Jr. in fifth. Kopcik took second and Ted Christopher moved into third as Galko slid back to fourth. Galko would lose fifth to Mike Christopher, Jr. and Ted Christopher took second from Kopcik before Pitkat spun on the frontstretch to bring the caution out with 37 laps complete. Kopcik was parked by officials for overaggressive driving on the track. Pennink took the lead with Christopher and Christopher, Jr. side by side for second with Rocco right on both of their bumpers in fourth. Ted Christopher took second on lap-39 and he was right behind Pennink as they took the white flag. Christopher couldn’t get close enough to Pennink as Pennink took down his fifth win of the 2016 season. Mike Christopher, Jr. finished third with Galko and Rocco rounding out the top-5. In the 40-lap SK Modified® feature event, Tyler Hines took the lead at the start with Stephen Kopcik slotting into second. Michael Gervais, Jr. was third with Tom Bolles fourth and Keith Rocco was fifth. Rigth behind Rocco was Eric Berndt and Woody Pitkat. Kopcik moved to the lead on lap-5 and he brought Gervias and Rocco with him as Hines slid back to fourth. Berndt was side by side with Hines and he took fourth on lap-9 as Gervais got around Kopcik to move into the lead. The caution came out with 13 laps complete for spins in turn 3 by John Montesanto and Tommy Membrino, Jr.
Ed Spiers spun on the restart along with Payton Henry to bring the caution right back out. Gervais took the lead with Rocco on his bumper on the next restart. Berndt made a strong move 2 laps after the restart to move into third with Kopcik fourth and Rowan Pennink was up to fifth. Rocco was hounding Gervias for the lead while behind them Pennink was on the move as he took third place from Berndt on lap-21. Bolles spun in turn 4 to bring the caution out with 21 laps complete. Gervais took the lead on the restart with Pennink and Rocco side by side for second. Pennink took the spot and beganto set his sights on Gervais for the lead. Pennink took the lead from Gervais on lap-26 and he immediately began to pull away as Rocco was now hounding Gervais for second. Right behind Rocco was Danny Cates and Pitkat. Pennink led Gervais to the checkered flag to pick up his fourth win of the 2016 season. Rocco finished third with Cates and Pitkat rounding out the top-5. In the 42-lap SK Modified® feature event, Dan Avery took the lead at the drop of the green with Michael Gervais, Jr. moving into second after nearly taking the lead from Avery. Keith Rocco was third with Matt Galko moving into fourth and Tyler Hines rounded out the top-5.Rocco quickly took second from Gervais on lap-4 and he began to set his sights on Avery for the lead. Galko and Hines both got by Gervais on lap-8 to drop Gervais back to fifth as Rocco was looking high and low for a way to get around Avery for the lead. Ronnie Williams was on the charge as he got by Gervais for fifth and then took fourth from Hines on lap-10. Williams continued his charge as he took third from Galko on lap-12 as the caution came out with 12 laps complete for a spin on the backstretch by Tommy Membrino, Jr. The field completed one lap back under green before the caution came right back out for a spin by Matt Gallo in turn 4 that collected the car of Josh Wood. Rocco made a bid for the lead on the restart but Avery was able to hold off his challenge and remain as the race leader. Williams was up to third with Galko fourth and Hines in fifth. Hines touched wheels with Todd Owen which got Hines sideways and he nearly spun in turn 2 to bring the caution out with 16 laps complete. Avery took the lead on the restart with Rocco and Williams behind him. Williams went side by side with Rocco with Ted Christopher moving up to fourth before the caution came out with 19 laps complete for a spin in the middle of turns 3+4 by Ed Spiers. Avery and Rocco resumed their side by side duel for the lead on the restart with Avery getting clear to the lead after 2 laps. Williams was able to get by Rocco and take over second while Christopher and Galko were fighting for fourth behind Rocco. Christopher got clear of Galko on lap-23 and Rowan Pennink was up to sixth behind Galko after starting deep in the field. The caution came back out with 26 laps complete for Hines, who spun in the middle of turns 3+4. Avery took the lead back under green with Rocco and Williams going side by side for second. Rocco took the spot on lap-28 and Christopher was able to follow him by Williams, who fell back into a side by side fight with Pennink for fourth. Pennink would take that spot to drop Williams back to fifth after he was just challenging for the lead before the caution. Spiers spun in turn 1 to bring the caution out with 32 laps complete. Avery took the lead on the restart with Rocco behind him in second. Christopher was third but he got sideways in turn 2 on lap-34 and lost 10 spots to fall back to 13th while Pennink moved into third, Williams moved up to fourth, and Woody Pitkat was now up to fifth. Tom Bolles brought the caution out with 38 laps complete as his car was off the pace and it came to a stop before he could get it behind the pit wall. Avery and Rocco ran nearly a full lap side by side before Avery got clear into the lead. Pennink got by Rocco to move into second with two laps to go. Pitkat was fourth behind Rocco with Williams in fifth. Pennink made a strong move to the inside of Avery as they were coming to the checkered flag but he couldn’t make it stick as Avery took the checkered flag for his first win since the 2013 season. Rocco finished third with Pitkat and Williams rounding out the top-5. WINCHESTER, N.H. – Timmy Solomito was on cruise control Sunday. The Islip, New York, driver led every lap – twice pulling away from the field on late-race restarts – as he drove to Victory Lane in the Dunleavy's 200 at Monadnock Speedway. It was the third NASCAR Whelen Modified Tour win of the season for Solomito. It was the second straight win on one of tour's bullrings. Solomito won at his home track, New York's Riverhead Raceway on June 25. He opened the season at Connecticut's Thompson Speedway Motorsports Park with his first career victory. Rowan Pennink made a late bid for the win before settling for second, while Jimmy Blewett brought it home third. Eric Goodale and Justin Bonsignore were fourth and fifth, respectively. Championship points leads Doug Coby finished sixth, the last car on the lead lap. Solomito won his second career Coors Light Pole Award in qualifying Saturday, but late day rain pushed the evening race to Sunday afternoon. The first 153 laps ran Sunday without a caution. Solomito, with Coby on his back bumper, set a blistering pace in the No. 16 Diversified Metals Ford and lapped all but the top five before the first yellow flag flew. Solomito was able to cut into Coby's lead, with is now 34 after eight of 17 races. Max Zachem finished sixth, followed by Woody Pitkat, Rob Summers and Donny Lia. Lia is two points behind Solomito and a point ahead of Bonsignore. The NASCAR Whelen Modified Tour returns to Connecticut's Stafford Motor Speedway on Friday, Aug. 5, for the third of its four visits to the half-mile. Coby has won both previous races there this year. In the 100-lap NAPA SK 5k feature event, Brian Sullivan took the lead with Shawn Thibeault slotting into second. Stephen Kopcik’s car was off the pace on lap-2 and he brought the caution out as he limped back to pit road. Sullivan took the lead on the restart with Jeff Baral moving into second. Thibeault fell back to third with Eric Berndt up to fourth and Mike Christopher, Jr. was fifth. Baral was applying heavy pressure to Sullivan for the lead and he made a move to take over the lead in turn 3 on lap-6. Berndt followed him by as Sullivan fell back to third in line with Thibeault fourth and Christopher, Jr. was still fifth. Rowan Pennink and Ted Christopher were charging their way to the front as they moved into sixth and seventh on lap-8. Berndt was now the race leader with Baral right behind him in second. Sulllivan continued to run in third with Thibeault, Christopher, Jr., Pennink, and Christopher all single file behind him. Baral was working hard to find a way around Berndt to retake the lead but Berndt was able to fend off his challenges. Christopher, Jr. took over third from Sullivan on lap-16 as Baral was continuing to apply the pressure to the back bumper of Berndt for the race lead. Pennink and Christopher also got by Sullivan to drop him back to sixth in line. Ronnie Williams was working his way towards the front as he moved into sixth place on lap-21. Christopher had gotten around Pennink to move into fourth and he was now pressuring his nephew Christopher, Jr. for the third position as Berndt continued to lead Baral. The caution came out with 30 laps complete as a melee broke out off of turn 4 with Todd Owen, Tyuler Hines, Tom Bolles, Cam McDermott, Nick Salva, Shawn Thibeault, D.J. Burnham, and Joey Muccicciaro all coming together and blocking the racetrack coming out of turn 4. Berndt took the lead on the restart with Christopher getting around Baral to move into second. Christopher, Jr. was side by side with Thibeault for fourth place with Ronnie Williams in sixth. Christopher rode behind Berndt until lap-36 when he made a move for the lead in turns 3+4. Baral was third behind the lead duo with Williams now fourth and Pennink fifth. Christopher, Jr. was back to sixth, just in front of Keith Rocco. As the race hit the halfway point, Christopher was still out in front with Berndt staying glued to his back bumper. Williams had worked his way up to third with Pennink fourth and Woody Pitkat was another car on the charge, cracking into the top-5 for the first time on lap-48. With 30 laps to go, Christopher was still out front and he had started to build up some distance between himself and Pennink, who was now in second. Berndt was third with Williams and Pitkat making up the top-5. As Christopher began to navigate lapped traffic, Pennink was able to close down the gap and with 15 laps to go, Pennink was right on Christopher’s back bumper. Berndt was still running in third with Williams in fourth and Pitkat in fifth. Pennink again closed right on Christopher’s bumper as they worked their way around the lapped car of Frank Ruocco with 10-laps to go. Pennink took a look to the outside of Christopher, but Christopher shut the door on that move and he maintained the lead. Danny Cates spun on the frontstretch to bring the caution out with 94 laps complete and set up a 6-lap sprint to the finish. Christopher took the lead on the restart with Pennink and Berndt quickly lining up behind him. Williams was fourth and Christopher, Jr. moved up to fifth with a strong run in the outside groove. Pennink looked to be stronger than Christopher in turns 3+4 but Christopher looked to have the advantage in turns 1+2. Pennink made one final effort at the win but Christopher was able to keep the lead and he took down his second consecutive SK Modified® feature win. Berndt finished third with Williams and Christopher, Jr. rounding out the top-5. In the special 44-lap SK Modified® feature event in honor of Mario Fiore, Matt Galko took the early race lead with Cam McDermott and Jeff Baral lined up behind him. The caution came out with 2 laps complete for Nick Salva, who spun in the middle of turns 3+4. Salva was able to rejoin the field at the rear for the restart. Galko took the lead back under green with McDermott and Baral side by side for second. Baral took the spot on lap-4 and now Todd Owen was alongside McDermott for third. Owen took that position with Tom Bolles behind McDermott in fifth place. Baral was applying heavy pressure to Galko’s bumper but Galko was able to stay out front. Baral was finally able to get alongside Galko on lap-9 and he got clear to the lead on lap-10. Owen followed him by Galko to drop Galko back to a side by side battle with McDermott for third with Mike Christopher, Jr. in fifth. Ronnie Williams spun in turn 2 to bring the caution out with 11 laps complete. The field completed one lap before a multi-car incident in turn 2 brought the yellow back out. McDermott had heavy damage to his car while several others came to pit road. Baral and Owen spent a lap side by side for the lead before Baral got clear. Another multi-car incident in turn 2 involving Dan Avery, Danny Cates, Eric Berndt, Salva, and Tommy Membrino, Jr. brought the caution back out with 14 laps complete. Galko took the lead from Baral back under green with Baral locked in a side by side duel with Ted Christopher for second. Owen and Ryan Preece were side by side for fourth with Keith Rocco and Tyler Hines behind them. Christopher was able to get in front of Baral on lap-20 to move into second and Bolles spun coming off turn 4 to bring the caution out with 20 laps complete. Christopher took the lead from Galko on the restart with Preece moving into second. Galko was third with Baral on his bumper in fourth and Owen was in fifth. Spins in turn 3 by Christopher, Membrino, and McDermott brought the caution back out with 22 laps complete. Preece got a monster restart and powered his way into the lead with Christopher slotting into second. Baral was third with Galko and Rocco side by side for fourth. Christopher came back to Preece’s inside in turns 3+4 to retake the lead on lap-24. Christopher and Preece were locked together and they were slowly pulling away from Galko and Baral to settle the race among themselves. After making an early pit stop under caution , Rowan Pennink was back up to fifth place with 12 laps to go. Owen’s car came to a stop in turn 4 to bring the caution out with 32 laps complete and erase the lead that Christopher and Preece had opened up. Christopher took the lead on the restart with Galko briefly pulling alongside Preece for second before Preece got clear of Galko. Pennink was fourth behind Galko with Baral in fifth. Preece was immediately beginning to apply heavy pressure to the back bumper of Christopher for the lead but Christopher was able to keep his #13 out front. Christopher held off Preece to the checkered flag to pick up his first SK Modified® win since the 2014 season. Pennink finished third, with Pitkat and Galko rounding out the top-5. In the 40-lap SK Modified® feature event, Brian Sullivan took the lead from the pole and he led the first lap before Nick Salva and Woody Pitkat came together and hit the wall in turn 3 to bring the caution out. Sullivan took the lead back under green with Todd Owen moving into second. Stephen Kopcik and Matt Galko were side by side for third with Tom Bolles in fifth. Just behind Bolles were Dan Avery and Jeff Baral side by side for sixth. Owen took the lead from Sullivan on lap-4 and then with 4 laps complete Michael Gervias, Jr. and Ted Christopher spun in turn 4 to bring the caution out. Owen took the lead on the restart with Kopcik and Sullivan side by side for second. Kopcik took the spot on lap-5 while behind them Bolles moved by Sullivan to move into third. Avery and Sullivan were now side by side for fourth place on lap-7 as Kopcik moved by Owen to take over the race lead. There was a multicar incident on the backstretch involving the cars of Pitkat, Danny Cates, Tyler Hines, and Jeremy Sorel that brought the caution back out with 7 laps complete. Kopcik took the lead on the restart with Owen in second. Bolles and Avery were side by side for third with Sullivan and Ronnie Williams side by side for fifth. Kopcik held the lead until lap-12 when Owen got a good run going down the backstretch and into turn 3 to move to the front. Kopcik came right back on lap-13 to Owen’s inside and he had the lead at the stripe. He got clear of Owen on lap-14 and Bolles also got around Owen to move into second and drop Owen back to third. Williams and Avery spun through the infield on the frontstretch to bring the caution back out with 16 laps complete. Kopcik took the lead back under green with Owen moving into second. Berndt and Bolles were side by side for third with Keith Rocco and Sullivan side by side for fifth and Ted Christopher was back up to seventh after his earlier misfortune. Berndt took second from Owen on lap-20 and just as he took second Sullivan spun into the turn 1 wall and collected the cars of Shawn Thibeault and D.J. Burnham to bring the caution out. Kopcik got the jump on the restart but Berndt moved into the lead with a pass in turns 3+4 with Rocco moving into second one lap after the restart. Rowan Pennink was looking to the inside of Kopcik for third with Owen in fifth. Pennink took third on lap-23 and Kopcik slid into line in fourth with Owen right behind him as Berndt continued to lead Rocco. Pennink was starting to apply heavy pressure to Rocco for second with 10 laps to go as Berndt continued to lead the race. Kopcik was fourth and Christopher had gotten around Owen to move into fifth. Pennink able to make a pass stick on Rocco to move into second on lap-38 as Berndt continued to lead the race. Berndt led Pennink and Rocco to the checkered flag to pick up his first win of the 2016 season. Kopcik finished fourth and Christopher rounded out the top-5. Friday night was a night to remember for Rowan Pennink at Stafford Motor Speedway. Following a nail-biting duel with Ryan Preece in the 40-lap NASCAR Whelen All-American Series SK Modified feature, Pennink made a sensational move to get the lead from Woody Pitkat to win the 80-lap Valenti Modified Racing Series event. Pennink came into the night with the one and only SK Modified race of 2016 on his trophy shelf. It looked as though he was assured his second victory halfway through the 40-lap SK feature until Ryan Preece came from 26th starting spot to dive past Pennink for the lead on lap 32. Pennink got right back into the fight taking the lead back with the same move two laps later and held Preece off for the final six laps. The momentum seemed to wear away a bit in the VMRS 80-lap feature as Pennink led from the pole, but lost the lead to Woody Pitkat on lap 5. Pennink would save his car over the next 55 laps and on a late restart he hung to the outside of Pitkat and executed a perfect crossover move off turn four to reclaim the lead on lap 61. The win was the 12th career MRS victory for Pennink, but the first since 2014 for he and car owner Gary Casella. It is a victory that Pennink has been eager to get. The Valenti Modified Racing Series heads north to Speedway 51 in Groveton, New Hampshire for stop number three of 2016 on May 28. STAFFORD – The reigning king of the SK Modified division at Stafford Motor Speedway is defending his throne with a vengeance thus far in 2016. Last year Rowan Pennink won his first SK Modified championship at Stafford Speedway. Friday he picked up his second victory in as many events this year. Pennink, of Huntingdon Valley, Pa., charged back after losing the lead late to Ryan Preece, then held off Preece in the closing circuits to win the 40-lap SK Modified feature Friday at Stafford. Pennink also scored victory in the 45-lap feature for the division at the NAPA Spring Sizzler on April 24. Pennink started 13th in the field. By lap 18 he went by Glen Reen for third. “We started a little deep there and had to stay patient there coming through the field and missing some wrecks there,” Pennink said. On lap 20 Pennink moved past Matt Galko for second and began stalking then leader Eric Berndt. On lap 22 Pennink got under Berndt in turn four and half a lap later he moved past Berndt to take over the top spot off turn two. Preece moved to second past Berndt on lap 26 and by lap 30 he was looking to make a low move under Pennink out front. On lap 32 Preece made the low move work into turn three to grab the top spot. But it was a short ride out front for Preece, who started 26th in the field. On lap 35 Pennink went diving under Preece into turn one and came out of turn two with a lead he wouldn’t relinquish the rest of the way. (Stafford Springs, CT)—Stafford Motor Speedway’s 45th Annual NAPA Auto Parts Spring Sizzler Weekend continued on Sunday, April 24 with feature events for the SK Modified® and Late Model divisions. It was déjà vu all over again on Sizzler® Sunday as Rowan Pennink scored the win in the 40-lap SK Modified® feature and Michael Bennett took the checkered flag in the 30-lap Late Model feature event. Both drivers repeated their Sizzler victories from 2015. In the 45-lap SK Modified® feature, the field took the green flag with Cam McDermott and Brian Sullivan side by side for the lead. They ran three laps side by side before McDermott got clear to the lead. Once McDermott got clear of Sullivan, Jeremy Sorel moved into second and he then took the lead from McDermott on lap-4. Todd Owen was now up to third behind Sorel and McDermott with Eric Berndt and Sullivan in fourth and fifth, just in front of Woody Pitkat. The positions continued to shuffle as Pitkat moved into fifth and Rowan Pennink was right behind him moving into sixth when the caution came out with 6 laps complete for spins in turn 2 by D.J. Burnham, John Catania, Joey Mucciacciaro, and Mike Christopher, Jr.
Owen got a great restart and powered his way by Sorel to take the lead. Berndt settled into third behind Sorel with Pennink fourth and McDermott fifth. Pitkat was still sixth with Glen Reen right behind him in seventh. Sorel was applying heavy pressure to the back bumper of Owen and they touched on lap-11 but kept on racing. Berndt moved around Sorel on lap-12 to move into second and he took over from Sorel in applying heavy pressure to Owen for the lead. Pennink went around McDermott to take over third just before the caution came out for a spin coming out of turn 4 by Nick Salva. Owen took the lead back under green while Pennink was able to slide in front of Berndt to take over second. Pitkat was fourth behind Berndt with Sorel, Reen, and McDermott lined up behind Pitkat. Pennink stalked behind Owen until lap-20 when he made his move coming out of turn 4 to take over the lead. Berndt spun in turn 2 to bring the caution out with 20 laps complete. Pennink continued to lead the race on the restart while Tom Bolles did a quick 360 through the frontstretch grass but was able to continue and the race stayed green. Pitkat moved into second on lap-22 and both Reen and Ted Christopher followed him past Owen to drop Owen back to fifth before Bolles brought the caution out with 23 laps complete. Pennink again took the lead on the restart while Pitkat was able to hold off a challenge from Reen to maintain second. Owen and Reen were side by side for third with Christopher, Sorel, and McDermott lined up behind them. Matt Galko was now up to 8th place after starting in 26th due to an engine issue in his qualifying heat. With 15 laps to go, Pennink held the lead over Pitkat, Reen, Owen, Ted Christopher, Sorel, McDermott, Galko, Ronnie Williams, and Mike Christopher, Jr. The caution came back out with 32 laps complete for spins in turn 4 by Salva and Michael Gervais, Jr. and Dan Avery spun in turn 2. Pennink took the lead back under green with Reen again challenging Pitkat for second. They rode side by side for second before the caution came out with 33 laps complete when Galko spun in turn 3 and several others spun. On the restart, the cars of Sullivan and Ronnie Williams came together and went into the turn 1 wall and McDermott ended up spun into the backstretch wall to bring the caution out. On the restart, Mike Christopher, Jr. spun through the infield and Jeff Fialkovich and Salva got together and came to a stop against the frontstretch wall to bring the caution right back out. Pitkat was able to hang with Pennink until turn 3 on the restart before Pennink got clear into the lead. Reen moved up to second with Pitkat falling back to third. Christopher, Jr. spun on the frontstretch and collected the car of Keith Rocco to bring the caution back out with 35 laps complete. With the caution displayed to the field, Owen’s car came to a stop in turn 4 out of gas to end his great run. Pennink took the lead back under green with Reen taking second. Sorel and Pitkat were side by side for third with Joey Mucciacciaro moving into fifth. Dan Avery had worked his way back through traffic after his earlier spin and was up to sixth with Burnham falling back to seventh. Sorel was working Reen over in a fight for second and he was able to make a pass stick on lap-40 as he took over second. Pitkat followed him through to move into third and the caution came back out with 40 laps complete as Gervais, Bob Charland, and Tommy Membrino, Jr. all spun in turn 3. On the restart, Mucciacciaro spun in turn 2 to bring the caution right back out. On the next restart attempt, Pennink resumed the lead while Pitkat and Sorel were side by side for second and Avery and Reen were side by side for fourth. Sorel took second while Avery moved to the inside of Pitkat before Berndt spun in turn 2 to bring the caution out with 43 laps complete and set up a green white checkered finish. Pennink resumed his place at the front of the field while Pitkat got by Sorel for second. Pennink led Pitkat back to the checkered flag to repeat his Sizzler victory of one year ago. Sorel finished third, with Sorel and Ted Christopher rounding out the top-5. NASCAR Whelen Modified Tour driver Rowan Pennink and longtime racing team owner Bob Hitchcock have proved themselves to be a great team when it comes to finding success on the racetrack in Modified racing. Now the pair is hoping to bring that flair for success together to the business of racing. Pennink and Hitchcock recently partnered to buy the former Independent Wheel of Webster, Mass., which had previously been owned by Ron Vigeant. The company provides racing wheels to a host of different racing levels and track divisions across the Northeast. Pennink won a championship driving at Stafford Motor Speedway driving for the SK Modified team owned by Hitchcock and Kelly Iverson. The group has also worked together on the Whelen Modified Tour. Their new company, which will be known as Independent Wheels Inc., will be based in both Charlton, Mass. and New Egypt, N.J. and is prepared to handle customers immediately. Iverson will also serve in the ownership group. Iverson said the new company is looking to do their best to swiftly connect with previous customers and new customers. Those looking to contact the company now can email at hitchcock3718@verizon.net or call 508-671-0036. Rowan Pennink will be competing for as many as four different race teams in 2016, in his quest for several different modified championships this upcoming season. The Huntingdon Valley, Pennsylvania driver will kick of the season in two new rides for 2016. Rowan will be taking over the driving duties for one the most legendary teams in modified racing, the Boehler Racing Enterprises-Ole’ Blue #3. Rowan will compete full-time in 2016 on NASCAR Whelen Modified Tour beginning at Thompson Speedway Motorsports Park at the annual Icebreaker event in April. Also occurring at Thompson Speedway, Rowan will return to full-time Sunoco Modified competition in the seat of another car rich in tradition, the Dickie Ceravolo owned #16 machine for 2016. In addition to his new NASCAR Whelen Modified Tour and Thompson Sunoco Modified teams, Pennink will return to two of his most familiar rides in 2016 as well. Rowan and his #99 Hitchcock Pool Water team will look to defend their 2015 Stafford Speedway SK Modified championship by returning full-time to Stafford in 2016. Rowan will also return to Gary Casella’s, Roscoe Racing #25, for a full slate of Tri-Track Open Modified Series events, as well as a limited number of Valenti Modified Racing Series dates with the team that earned the 2013 series championship. The potential exists to add additional events, on open weekends, at the New-London Waterford Speedbowl in SK Modified competition. Those events might be run in either in the Ceravolo #16 or in a Pennink Motorsports entry that will be maintained at the Pennink family’s race shop. One thing that is a guarantee, if there is a modified race held in the northeast in 2016, you can bet that you’ll see Rowan Pennink behind the wheel. Stay connected to Rowan and his team’s endeavors right here, at rowanpenninkmotorsports.com, all season long in 2016. STAFFORD – Rowan Pennink arrived in an SK Modified at Stafford Motor Speedway in 2006 as a little known 20-year old from Pennsylvania. Despite winning the 2006 SK Modified Rookie of the Year award, Pennink hardly made much of an impression that year at the track. But over the last decade the Huntingdon Valley, Pa. driver has established himself as one of the most consistent Modified pilots in the Northeast. Sunday at Stafford Motor Speedway the 30-year old cemented his legacy forever at the half-mile oval. Pennink finished fourth in Sunday’s 40-lap NASCAR Whelen All-American Series SK Modified feature to clinch his first career SK Modified championship at the track. Pennink finished the season with six victories, 17 top-fives and 19 top-10’s in 22 events this year. He led second place Ryan Preece by 10 points to end the season. Preece finished second in the SK Modified standings at Stafford for the third consecutive year. The championship chase for Pennink essentially began in July of 2014. After a rough start to the 2014 season Pennink got on a roll over the closing half of the year, rolling to five victories to close out the season. Those downs came late in the year for Pennink and made for some drama going into the final event. With three races left this season Pennink held a 48-point lead over Preece, but Preece lopped 36 points off that lead going in the two events before the season finale. Preece finished third in Sunday’s feature. Though Sunday’s feature wasn’t without drama for Pennink, right from the start. On the first lap Pennink had to dodge a diving Joey Cipriano in turn one. On a lap 23 restart Pennink fell from fifth to eighth in the field, a spot that would have cost him the championship with Preece leading at the time. “I was having a little bit of trouble shifting into high gear,” Pennink said. “That one restart I really didn’t expect to fall back like that. But I was able to battle back and get back up there to finish fourth. I definitely didn’t want that to happen, but we were able to overcome it."